This year’s athlete lineup included Justin Anderson, current Los Angeles Angels Pitcher; Dain Blanton, AVP Pro Volleyball, and former USA Olympic Gold Medal Beach Volleyball player; Rod Carew, Hall of Famer, All-star, and Major League Baseball MVP; Chuck Finley, All-Star, Angels Hall of Famer; Bobby Gritch, All-Star, Angels Hall of Famer; Jason Lezak, former USA Olympic Gold Medal swimmer; Deck McGuire, current Los Angeles Angels Pitcher; Olden Polynice, Los Angeles Clippers alumni; Matt Shoemaker, current Los Angeles Angels Pitcher. The event was presented by sponsors Dr. James P. Lin and Mrs. Grace Lin, and Mr. and Mrs. Samuel and Sherri Mirejovsky, in addition to more than twenty companies and community organizations who sponsored the tournament. 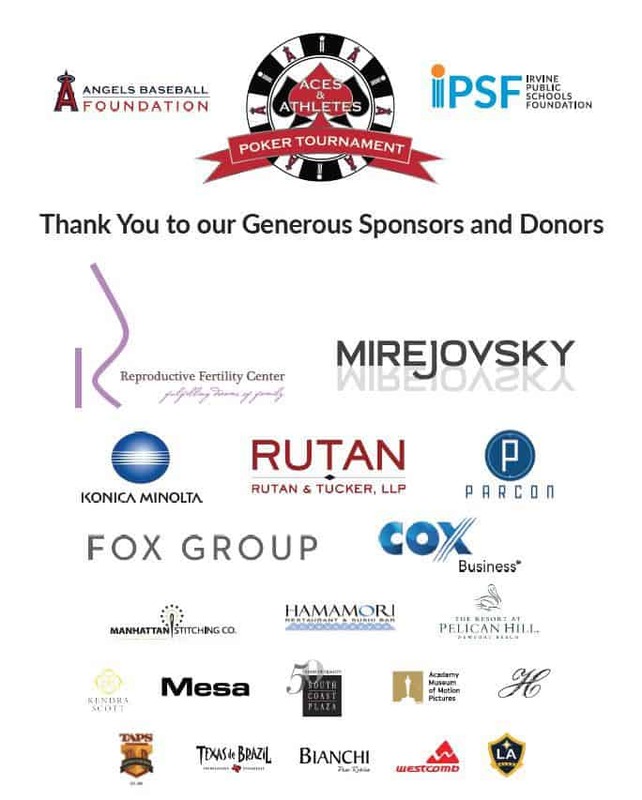 IPSF welcomed an extended list of returning and new sponsors, including Angels Baseball Foundation, Reproductive Fertility Center, Konica Minolta, Rutan & Tucker, LLP, PARCON Media, Fox Group, COX Business, Manhattan Stitching, Hamamori Restaurant and Sushi Bar, The Resort at Pelican Hill, Kendra Scott, Mesa, South Coast Plaza, Academy Museum of Motion Pictures, Haute Productions, TAPS Fish House & Brewery, Texas de Brazil, Bianchi Paso Robles, Westcomb, and LA Galaxy. Thanks to their generous involvement, IPSF can increase its commitment to providing scholarships for low-income students to participate in afterschool and summer programs.